Today’s theme at the Corrosive Challenge Blog is “Forever Young” and it is sponsored A & T Designs, home of the emerald fairies. For my card, I used Isabella. 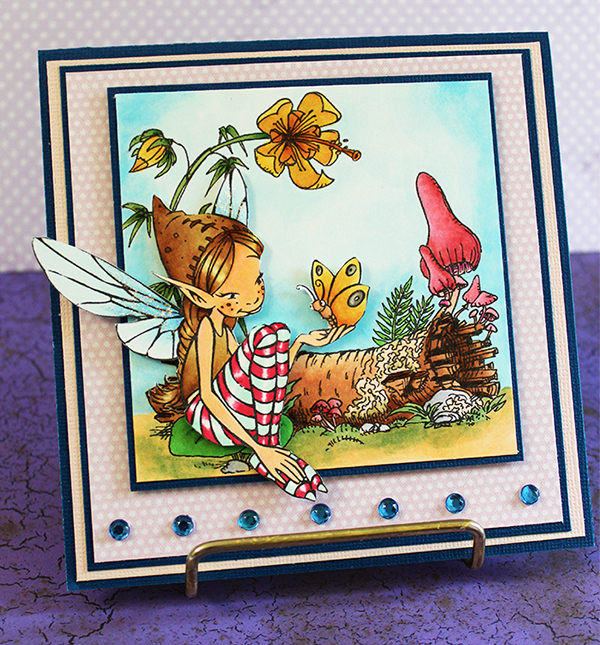 I also used a background image from Make it Crafty. After coloring the background, I then colored Isabella, cut her out and popped her up on top of my background. I hope you enjoy seeing her – she was a lot of fun to color! Thanks for stopping by! This week at the Corrosive Challenge the theme is “In Stitches” and it’s sponsored by A&T Designs (home of The Emerald Fairies) and you can see all their awesome images here! For my card, I choose Jewel. I colored her with Copics and stitched around my panels to satisfy the challenge requirement, then added some daisy embellishments and a cute little ladybug. Thanks for stopping by and I hope you come play with us this fortnight at The Corrosive Challenge Blog!